OMG! This cereal is super awesome. For real? For real. Very good? Try very, berry, scary good! If cereals were songs, this cereal would be a Justin Bieber song... WITH Miley Cyrus... AND Willow Smith. OMG! 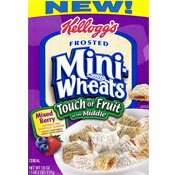 The complete name of this product is Kellogg's Frosted Mini-Wheats Mixed Berry Touch Of Fruit In The Middle. The description on the back of the box is right on the money: "Lightly frosted layers of whole grain wheat with a delicious filling made with real fruit." This cereal actually smells like Kellogg's Pop-Tarts when you open the box. It reminded me of the short-lived cereal Pop-Tarts Crunch from 1994. Cereal aficionados might remember similar discontinued cereals like Fruit Wheats (1986), Strawberry Squares (1984) and Raisin Squares (1982). The berry filling tastes like preserves, like berries (mostly strawberry) and sugar. It's a big, authentic flavor that dominates every bite. This cereal's nutritional profile is fairly impressive: 6 grams of dietary fiber per serving. Only 1 gram of fat with 0 trans and 0 saturated. 5 grams of protein. Each serving has 10 grams of sugar. That's not great, but it is only one more gram than Honey Nut Cheerios and some varieties of Special K. There's actually less sugar here than in some other Frosted Mini-Wheats varieties and this cereal comes across tasting sweeter. The first ingredient listed in the ingredients list is whole grain wheat. Unfortunately, high fructose corn syrup is listed in the ingredients twice... once as a part of the filling and once as part of the biscuit. Overall, I loved this cereal. Highly recommended. 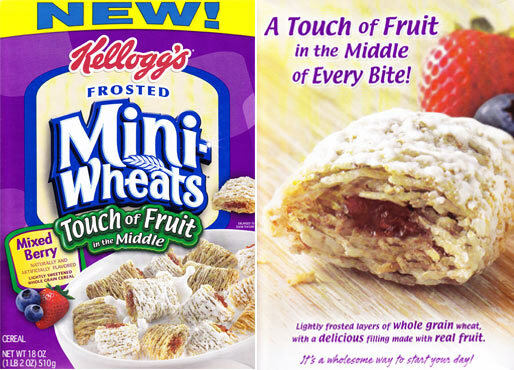 What do you think of Touch Of Fruit Mini-Wheats? We recently tried Touch of Fruit Shredded Wheat and liked it as a family, but then we were faced with the new smaller more expensive boxes. What a rip off! Do they think that consumers are fools? We will look for a product in a real box. (As I'm eating this cereal now...) When I first bought it, I was hesitant about the fruit filling... I imagined it would only be a small portion of fake fruit. But nope, you can easily taste it, and dang does it taste good. Highly recommend this cereal. I was disappointed. I could hardly taste the fruit and when I ate it dry, it tasted a bit stale. Not at all what I expected. I like the strawberry frosted Mini Wheats much better. I don't think I will buy these again. It was pretty good. Not really what I hoped it could be. Tasted way too fake of a fruit flavor. Sorry I got the wrong product? I was thinking of the Nestle mini shredded wheats, I haven't tried these ones, maybe I will try them, but yeah I was disappointing with the Nestle ones. - Steven. I had the "strawberry" one, and I'm sorry to say I didn't like them. The "fruit" is more like paste or jam than to me. I hoped they would have been like them Jordans cereals with actual little bits of real fruit in them. I do have sugar on my normal shredded wheat which I think is fine in moderation. I really enjoy this cereal dry too. It's a new all time favorite! Thanks yum! I really liked this cereal. I was able to get it for just 1.50 with a doubled coupon. Yup, it's the return of the Fruit Squares. Though the originals were better, this is close. Now if only they'll give us this in a strawberry-filling version, instead of the weird pink frosting they do have now. I'm not so much of a cereal eater but saw this stuff on display at front of store. When I do eat cereal its usually raisin bran or oats or mini-wheats and this, in my opinion is the best of both. No more stale boxes of uneaten cereal in my cabinet to be thrown out. Its by far the best cereal I've ever eaten, not too sweet and the filling actually tastes like homemade preserves (fresh). I'll be eating more, more, more. I love this cereal! Anyone who says too much sugar is a moron. Go eat your morning glory soy sausages... I love my berry filled mini wheats! How can anyone eat this ****. Full of fructose, which is very bad for you. Why not eat cereals without sugar or fructose. This cereal is GREAT, it's the perfect amount of sweetness without going over board. The fruit in the middle gives a great accent without being over powering. This is my new favorite. It's filling to which leads to a great morning. I LOVE this cereal! Ever since the old cereal "strawberry squares" was discontinued, I had hoped for something equivalent to come out and replace it; this definitely did the job! I say they could even put a little more fruit inside if they wanted! Keep this cereal on the shelf FOREVER! Wish they'd bring back Raisin Squares. 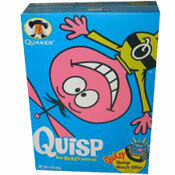 They were the best cereal ever! As soon as I saw this cereal in the store, I thought, finally! There's fruit-in-the-middle shredded wheat again! I couldn't figure out why they had flavored frosting on the top but not strawberry fruit in the middle like when I was a kid. This takes me back. It's nice and nostalgic. I have to say, though, it wasn't quite like I remembered it as a kid. It seems a bit more bland than the frosted kinds, actually. I would have liked to have just a bit more preserves in there. Or perhaps, berry frosting and fruit in the middle! (If it doesn't mean too much sugar). I think they're still more fun than the frosted kind, though. I agree that the chocolate and blueberry ones are tastier. I'll probably buy this cereal once in a while, but I feel like I might get bored of the blandness of wheat. I still like oats way better than wheat. My favorite memory is coloring with blue pen on a blue box of Aldi shredded wheat to make it say Frosted Shredded Fat. I think this cereal is AWESOME! The fruit filling adds an extra sweet touch. I bought 3 boxes - 1 box first to try, and then 2 more boxes the next day. It's a great snack at work too! See I agree, they do smell like poptarts when you open the box, so I got excited, but I was really let down once I ate them. They just weren't very good. I'll spend my money on the chocolate ones next time, now those are amazing!